Welcome! We have six FREE videos right on this page for you to watch! 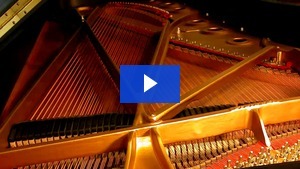 Take a step-by-step video tour of the piano buying process. From "what to avoid" to "how to negotiate" - great examples, animation and information to help you avoid EXPENSIVE mistakes. Click Here To Get Your PRINTABLE Documents for Video 6! We really hope you enjoyed these videos! Charles was delighted to make them for you, it took him 2 years (they were a lot of work)! If you have any questions or comments you can email Charles at our website contact page: CLICK HERE TO Contact Us! Charles and his wife do most of the customer service at www.perfectlygrand.com! For piano lamps -- we are only 4 miles away from House of Troy -- the Vermont based manufacturer of over 300 styles of piano lamp and we pick up and ship their beautiful lamps every day! For all our great piano accessories and piano oriented gifts and more go to our home page: Perfectly Grand! Charles went to North Bennet Street School and graduated as a Craftsman in 1985. He is a Registered Piano Technician and has tuned for concerts, piano teachers and piano lovers ever since. Charles and his wife Morna started Perfectlygrand in 1995!